As the days get longer and the thoughts of spring are tantalisingly close, an area of the garden behind the Beech hedge is in its full glory just now. 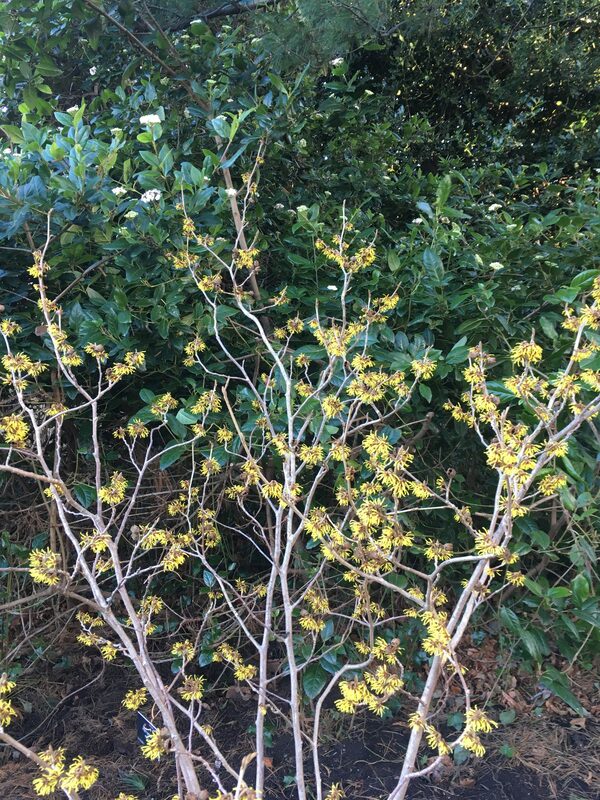 The Winter Garden leading down a winding path to the Queen Mother’s Memorial Garden has recently had a makeover with the addition of Hamamelis mollis and its spidery flowers which appear before leaves and its scent which both help this plant stand out well on a dull winter’s day. The Winter Garden brings together interesting bare stems of Acer pensylvanicum and Sarcococca confusa with fragrant ivory flowers followed by black berries. One of the tallest plants in the Winter Garden is our Cornus mas or the Cornelian cherry. 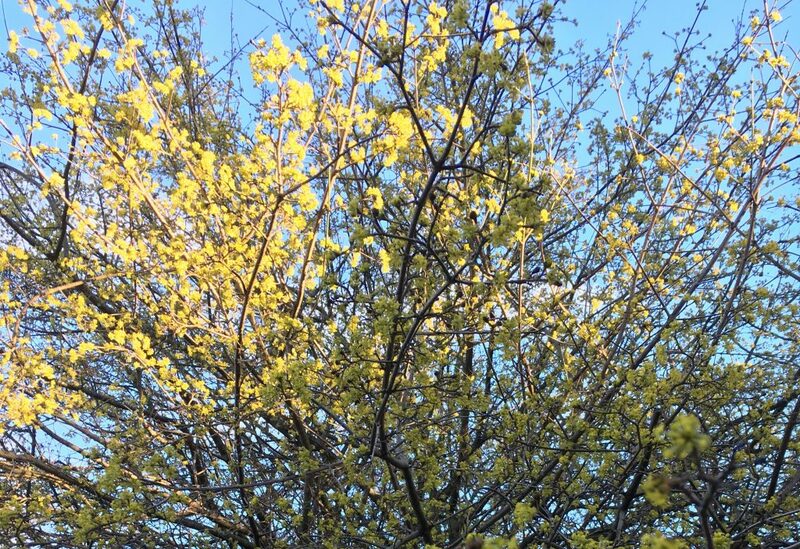 It is a reliable shrub or small tree with its main season of interest in early spring when small bright yellow flowers cover the bare stems. Some of our shrubs with evergreen foliage and interesting leaf shapes also play an important role when considering plants for a winter garden, Our Mahonia x media ‘Charity’ certainly ticks this box with its evergreen handsome spiny foliage and its lemon yellow scented flowers spikes which rise above the leaves on a February day. Skimmia japonica another new addition with its compact mound of evergreen foliage supporting conical heads of white buds. Viburnum tinus which can grow to 3m has dark green evergreen leaves and with its small creamy white flowers, which take on a hint of pink, flowers over a long period in late winter to early spring. Also included under foliage is the Euonymus fortune ‘Silver Queen’. It has inconspicuous green flowers in summer but it is really grown for its dark green foliage margined with white . As we move into spring the Narcissus come into their own. Narcissus pseudonarcissus ssp. Pseudonarcissus and Narcissus ‘Jenny’ are guaranteed to brighten up the ever lengthening days. With the garden plants now fully coming out their winter slumber this area of the garden will shortly lose its full glory of winter and visitors will continue passing on their way to the Queen Mother’s Memorial Garden and its full range of plants of summer.